Documents and information remain secure within your organization’s Office 365 tenant and existing security policies. Decisions does not store sensitive data and information outside your organizations Office 365 tenant. Decisions must be enabled for your organization’s Office 365 environment by an Office 365 administrator. Make sure to login with an Office 365 administrator account. Step II: View and accept the list of permissions. 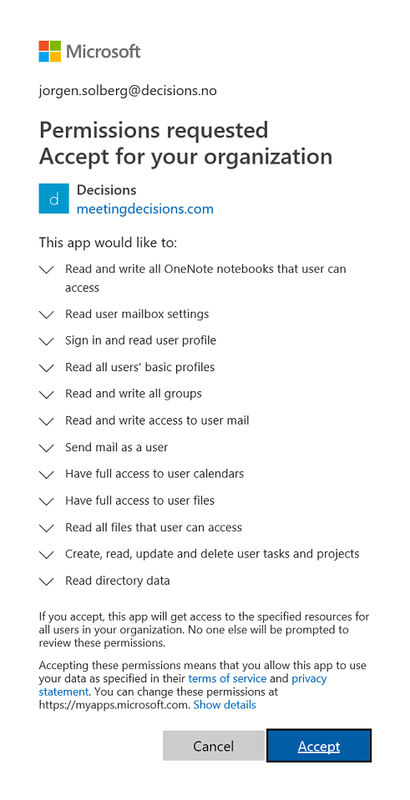 Decisions uses “delegated permissions” as defined by Microsoft. The permissions apply only to logged-in users of Decisions. Access to Decisions does not grant users additional authorization beyond their existing permissions. For the delegated permissions used by Decisions, the effective permissions will be the least privileged intersection of the delegated permissions the application has been granted (via consent) and the privileges of the currently signed-in user. The application will never have more privileges than the signed-in user. You will be prompted with the list of permissions that Decisions requires. For more details on how the Decisions application uses these permission scopes, read more here. Click Accept to approve the permissions and allow your organization to access the Decisions application. Verify that you are directed to the Decisions permissions confirmation page. Decisions is now enabled for your organization. Reach out to our support team at support@meetingdecisions.com if you have additional questions.